Presentations eBook to get make you a much more effective and successful presenter! Become a better and more succesful presenter! Win over more clients with a great presentation! Become a wanted speaker with excellent presentation skills! You don’t need to spend 500, 800 or even 1,500 dollars on a two-day training course to get better!! And you don’t need to be a PowerPoint (or KeyNote) guru to be able to do great and effective presentations!! “Presentation Essentials – 39 Ideas on Presentation Content, Design and Delivery” – at 95 pages, this book is easy to read and gives the potentially excellent presenter 39 ideas on how to design and improve their presentations significantly. You can read a sample from the eBook here. 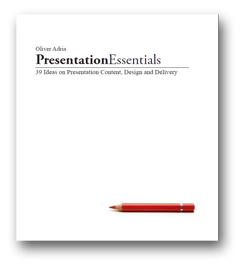 This eBook covers many presentations aspects, from how to design a presentation (e.g. Idea 8 on creating a storyline) to motivation to do a presentation (Idea 30 on preparing for the worst). Each idea is 1-3 pages long and easy to digest. This book is a great way to jump-start your presentation skills! Get it today! When I started out with presenting, I asked for some comments afterwards and all I got was: “Yeah, uhm… it was ok.” (Which is code for it was really bad and they have nothing to actually say about it!!) But why?? I spent hours – no, days and weeks preparing that presentation. I used the best images I could find, the slides were done well, the design was ok. But why did I get such a bad feedback?? So if you think you’ve done really bad presentations – I’ve been there!! I learned and read and studied and practiced what there was to know about it. Why was my presentation bad? What can I improve? Where do I even begin? How do I become more effective??? What I realized was, that just by tweaking and changing a few things, things I thought were correct but were really wrong, you can get a different perspective on presentations and improve your performance significantly!! You might be still doing those things today! Get the eBook to stop going down that path and become much more succesful in presentations! It’s not more work, it’s different work! And sometimes it’s even less work! Once I’ve internalized this, I figured out how to do much more awesome presentations. The result was so good, about a year and a half later I was a guest speaker doing a 75 minute presentation (including some interactive parts) as part of a 2-day-long seminar and one of the first reactions I got was: “Aww, why does it have to be such a short presentation? ?” A few days after the presentation I got a couple of messages (this was a presentation to only 25 people!) from people who only wanted to say that it was the best presentation they’ve seen in those 2 days and that they would like it, if they could add me to their business online social network! So, with presentations, I was able to expand my network! And people came to me – and not vice versa! Just by using some of the ideas (each of them readable in 5 minutes) you can already stand out with your presentations! These are not hard-to-follow ideas and techniques. All you need is to try some of these things and you will notice that your presentation will improve! WARNING!! I will tell you this: Just by buying this eBook you won’t become the presentation guru overnight. You will need to be open to some of the ideas. Most of them are easily understandable and common-sense, but most people don’t do them!! So you will need to actually apply and really test these ideas in order to actually see results! Owning an eBook doesn’t mean anything. You need to want to become better and apply some of the ideas and techniques! Become better at creating great presentations directly! Increase the effectiveness of your presentation without more work! Get to know some easy-to-learn tweaks to improve design and delivery! Presentation Essentials costs only $19.95! And you can learn the techniques within a few days (or if you’re really eager, you can probably get going within a few hours)! Even if you have a presentation real soon, you can already directly apply many of these ideas NOW and become more succesful in delivering presentations!Imagine how many hours you can save (e.g. 2 days at a presentation course) and how much money ($1,000 and more for training courses). It’s not rocket science and it’s not a 4-week-bootcamp. The ideas are effective and easy to learn! You can already use them for your next presentation! So if you want to improve your presentation design and delivery skills, pick up this eBook today! Save (lots of) money, save (lots of) time on expensive courses, become an effective presenter! The eBook can be on your computer – ready to be read – within a 2 minutes! And if you have any questions, you can always write to me! My email is on this blog and also several times in the eBook! Get it now! You can pay via PayPal OR Credit Card OR bank account (where available). To pay directly via Credit Card, ignore the “Log In to Paypal” and click on “Continue” on the left side. Join Carole and 1.700 readers and subscribe to the Rethink Presentations newsletter! Do you want to learn to become a better presenter? For FREE? Subscribe to the newsletter and instantly download the one-page presentations checklist - it only takes 60 seconds! Prezi Review: More than just Buzz? Contact Me (Email link) I'm currently not accepting ANY guest posts. Thanks. This blog is about creating effective presentations and presentation design. Contents include strategy, delivery, design, techniques, tips and storytelling. This can be applied to business presentations, academia and anyplace where presentations are needed.